As you know, I only endorse businesses and products that I use and am happy with. Biome is such a business. 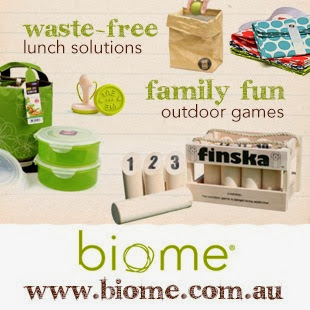 They have stores in Brisbane, Paddington and Milton so if you're starting to look for Christmas gifts or you want a good reliable source of organic and environmentally sound products, Biome is your place. In recent months I got new organic makeup from Biome and just last month received two mosquito repellant bracelets, colouring-in books and pencils for Jamie and Alex and new water bottles and refillable coffee cups for us. They have a good range of a wide variety of products that you can check out simply by visiting the website. They have an excellent online shop and postal service. Christmas gift ideas for kids: Green Start puzzles and books.